People pay more attention towards Punjabi Whatsapp status these days. Punjabi's always love to communicate in their native language. What is the reason behind it? The reason is that in one’s own languages, individuals feel more comfortable. Here you will get plenty of sad, love, happy, romantic, inspirational, and funny Punjabi Whatsapp status that you can share with friends, lover and relatives. Read our collection of Punjabi status for whatsapp and update your Whatsapp today with your mother tongue status. ਮੇਰੀ Girlfriend ਵੀ iPhone 8 ਵਰਗੀ ਆ.. ਹਜੇ ਤੱਕ Launch ਨਹੀਂ ਹੋਈ ???? 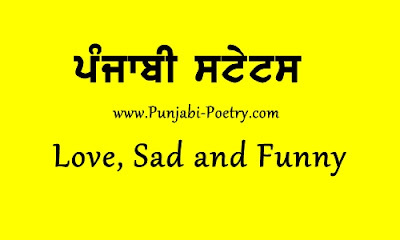 On our Punjabi Poetry blog you will find Punjabi status messages for any event and occasion. Wish your friends a very happy birthday in Punjabi. Make your anniversary status in Punjabi to let your friends know about your special moments. Funny Punjabi status are also available on our website. I am also a big fan of Punjabi status and I really like to put them on my wall or Whatsapp. So what are you waiting for, have a peek and check them out!